One fine night, Hollywood screenwriter Steven Phillips basks in the honor of a humanitarian award, presented to him at a black-tie dinner as his proud wife Laura and daughters look on. One crappy morning later, a junior studio executive is telling Steven that he's lost his creative "edge," and releases Steven from his contract. Desperately seeking counsel, Steven visits his friend, enviably successful screenwriter Jack Warrick. Jack confides to Steven that he himself was inspired to his ongoing success. Not by a muse, but by a Muse. Steven is incredulous as Jack tells him of Sarah, one of the nine daughters of the god Zeus. 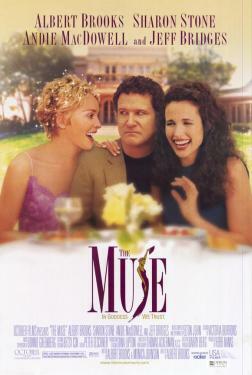 The Muses inspire creativity- and one, Sarah, has alighted in Hollywood. Steven is soon consumed by the prospect of becoming one of Sarah's clients. As a favor, Jack agrees to set up a meeting between Sarah and Steven.